With electricity demand in Vietnam growing 12 percent annually, the Vietnamese government has set a goal to generate 265 billion kWh of electricity by 2020 and 570 billion kWh of electricity by 2030. This is to meet the surging demand for power resulting from rapid urbanisation and industrialisation in the country. 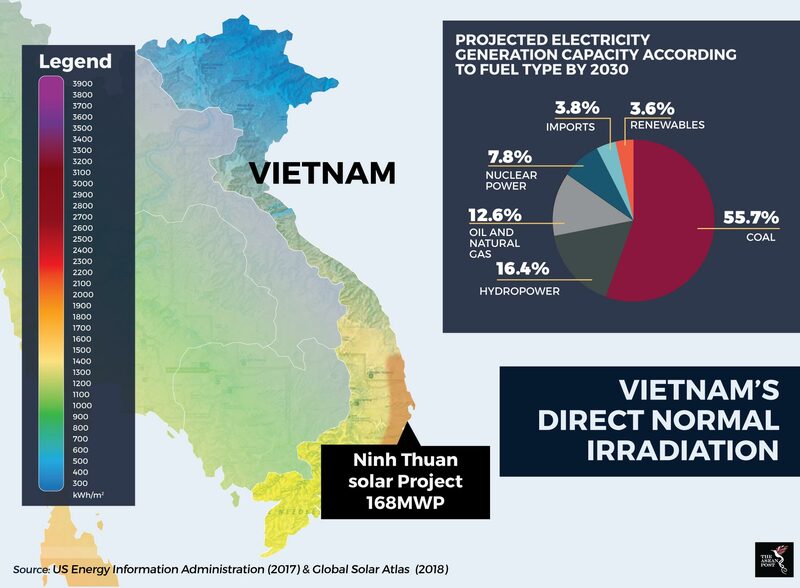 Currently, Vietnam produces more than 170 billion kWh of electricity from fossil energy sources, such as coal and gas – which are speedily being exhausted. According to the Vietnam Energy Outlook Report of 2017, Vietnam is moving over to renewable energy (RE) sources in order to sustain high electricity generation without incurring higher energy production costs as its energy demands increase. Amongst all RE potential, solar energy in Vietnam has been making the most headway in recent times. “We will release a plan in 2018 as there are now hundreds of solar energy investment proposals following the policy changes," Tang The Hung, a senior official in the energy department of Vietnam's Ministry of Industry and Trade said in September 2017. According to the Vietnamese Government’s targets, solar power is expected to become the main RE source in the future, with installed capacity to be increased from around 6-7 MW at the end of 2017 to 850 MW by 2020, accounting for 1.6 percent of the country’s power generation. This is expected to grow to 12,000 MW by 2030 or 3.3 percent of the country’s power generation. Thanks to Vietnam’s potential in large solar radiation, these goals should be highly attainable. Apart from that, low production costs and the government’s interest in developing renewables will also contribute to achieving these goals. Decision 11/2017 on the mechanism for encouraging the development of solar power projects in Vietnam was passed in April 2017, creating a wave of investment in solar power development. In addition, Vietnam Electricity (EVN) is investing in a number of solar power projects with a total installed capacity of 2,000MW in the provinces of Khanh Hoa, Kon Tum, Ninh Thuan, Binh Thuan and Dong Nai. Vietnam’s first large-scale solar project - the Ninh Thuan project - will tap into the country’s sizeable solar potential which will also create 200 job opportunities for locals and contribute to a cleaner energy mix for the country. Sunseap International, the international arm of Singapore’s leading clean energy provider Sunseap Group, has signed an agreement with InfraCo Asia Development Pte Ltd to jointly develop the 168 MegaWatt-peak (MWp) utility-scale solar power project in Vietnam. The electricity generated by this plant is expected to power up to 200,000 households. The project is located in the Ninh Thuan province, on the south-central coast of Vietnam where some of the highest solar radiation readings have been recorded in the country. “The Ninh Thuan solar project is a utility scale, large solar project that required approval from the Prime Minister of Vietnam. We believe that Ninh Thuan will be one of the first larger-scale solar projects coming into operation in the country,” said Allard Nooy, CEO of InfraCo Asia in an e-mail interview with The ASEAN Post. “Projects like Ninh Thuan solar create a ‘demonstration effect’ that serves as a beacon for future development. InfraCo Asia is proud to serve as a clean energy pioneer in Vietnam and throughout the South and Southeast Asia regions,” he added. Apart from solar energy, the Vietnamese government has also approved a decision that supports the development of wind energy projects. Wind power capacity is also projected to increase from currently 200MW to about 800MW by 2020; 2,000MW by 2025 and 6,000MW by 2030. Combined wind and solar energy is projected to represent more than 5% of generation capacity in 2030. The alarm for RE has been sounding clearly as the demand for power in Vietnam continues to grow. To ensure national energy security, the government there has made a promising start by introducing new policies and allocating more funds to develop the RE sector.